The New Guinea campaign - which included Milne Bay and was typified by the Kododa Track - is seen as a defining moment in Australia's history. This was where the myth of the invincibility of the Japanese Army was first broken. The courage and heroism of our troops on the Kokoda Track must be one of the proudest and and most memorable episodes in Australia's wartime history. In May 1942 the Japanese attempt to take Port Moresby by sea was thwarted by the battle of the Coral Sea. The Japanese then decided to take Port Moresby by two approaches - the first by landing at Milne Bay on the south east tip of Papua and the second, by advancing across the Stanley Owen Ranges from Buna and Gona on the north coast. The first approach at Milne Bay on 26 August was repulsed by Australian troops with the help of fighter aircraft. The second approach, across the Owen Stanleys, which also began in force on 26 August, caught the Australians by surprise. The 39th Battalion had been ordered to cross the tortuous Owen Stanley Range to secure an air base at Buna, some 200 kilometres away. The heavily outnumbered, poorly prepared and lightly equipped Australian troops could not hope to match the battle-hardened, determined and well-equipped Japanese soldiers. 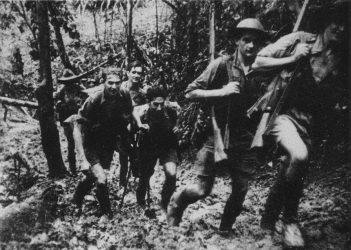 The fighting withdrawal from Kokoda back to Ioribaiwa and Imita Ridge took place under the most difficult conditions of terrain and climate. Initially the men of the 39th Battalion carried the burden alone for a month until they were joined by the 53rd Battalion and later, near Isurava, by the battle-seasoned AIF infantry battalions of the 21st Brigade. As our troops fought their way back towards Port Moresby, the Japanese lines of communication lengthened and ours shortened. Slowly at first, and then more decisively, our men began to get the upper hand. In numerous savage battles our forces gradually wore down the Japanese, who were unable to advance beyond Ioribaiwa. Then it was the turn of the AIF infantry battalions to take up the fight. Reinforced by the AMF 3rd Battalion, the 25th Brigade, the Second First Pioneer Battalion, and the Second Sixth Independent Company began the long and difficult journey back across the Owen Stanleys. The 16th Brigade was committed to operations in October. Our troops suffered greatly from extreme sleep deprivation, and from inadequate shelter, food, and medical supplies. Carrying around 30 kilograms of equipment on their backs, they battled the constant wetness, knee deep mud, and tortuous terrain of the Owen Stanley Ranges. On top of that they had to contend with the worst tropical diseases, and fevers such as malaria, hookworm, scrub-typhus, and dysentry. They did not have the jungle uniforms, lightweight packs, and efficient weapons of the enemy, and yet they brought the Japanese to a standstill. This campaign further demonstrated to the world the fighting qualities of Australia's fighting forces. More than 600 Australians died in the Battle of the Kokoda Track. A further 1015 were wounded. 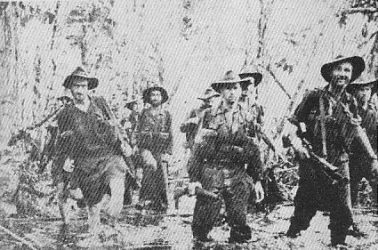 The Battle of Kokoda marked the turning point of the war in the south west Pacific. No longer could the Japanese pose a direct threat to Australia. The fearless courage and heroism of our Diggers during this campaign in the defence of Australia will always be remembered with great pride and honour.